A sub-title, Thirty-One Women on the Gifts That Mattered Most, provides dimensional definition to this collection of specially commissioned essays. The contributors, all well-known journalists and/or fiction writers, include Montgomery native Judith Hillman Paterson, who is scheduled to present a program at the 2013 Alabama Book Festival on Saturday, April 20. Among highly recognizable bylines are those of Ann Hood, Mary Gordon, Rita Dove, Marge Piercy, Joyce Carol Oates, Lisa See, and the book’s editor, Elizabeth Benedict. 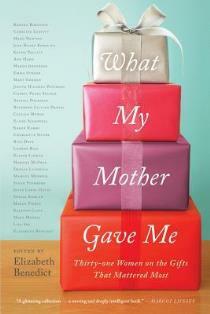 Although it’s logical to assume publication was timed to come out near Mother’s Day, each of the thirty-one authors has risen to the occasion of writing eloquently on-theme without over-sentimentalizing. Julia Oliver is the author of three novels, a collection of short fiction, three stage plays, and numerous articles and reviews.